of flowers and roses, every layer slowly appearing in the nose. Full bodied and well structured, strong and warm alcohol and smooth tannins are promising good aging. 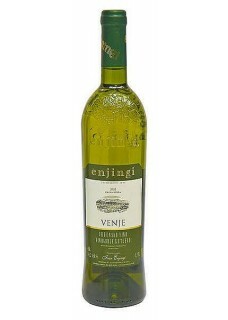 Enjingi's Venje 1998 received the prestigious award from the Decanter magazine for the best wine in the world in the class of blend white wines in the price category of up to £10. The award was accompanied by a large article entitled “Thank God for Croatian White Wines!”. From that moment on, the name of Ivan Enjingi started to capture the attention of the international wine public, specialized press, world famous enologists and sommeliers. This gold medal for the blend of white grape varieties grown on the location of Venje in Kutjevo vineyards was a promotion of priceless value for Croatian wines. The effect it had in the enological circles can only be compared to a gold medal in a world championship in sports. Food pairing: Cheeses, turkey, duck and Brodetto.